Double-reed instruments consisting of a curved conical wooden tube; the double-reed is inserted into a curved mouthpiece. Valved instrument whose tonal range is the lowest in the brass family; it consists of a coiled conical tube and an upturned bell. Instrument consisting of two metal disks that are struck together. Flat drum consisting of two membranes; stretched across the lower head are snares that produce a rattling sound. Instrument consisting of a large metal disk with a raised central portion that is struck using a mallet. Instruments consisting of a parabolic copper basin covered with a stretched batter head that is struck with a mallet. Valved instruments consisting of a coiled conical tube and a flared bell. Double-reed instruments consisting of a conical tube with holes (some closed by keys) and a slightly flared bell. Small transverse flute whose range is an octave higher than the regular transverse flute. 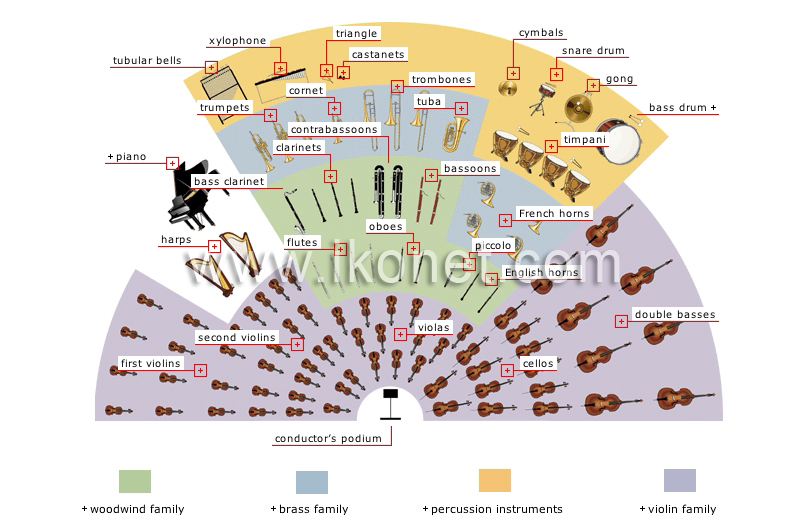 Four- or five-stringed instruments played upright; the largest of the violin family, they also have the lowest range. Alto oboes with a pear-shaped bell. Four-stringed instruments placed between the legs when played; they are about twice the size of a violin and their range is one octave lower than the viola. Small dais that the conductor stands on to direct the musicians as they play. Four-stringed instruments similar to a violin but played a fifth lower. The violins that support the first violins. The violins that play the melody. Plucked stringed instruments consisting of strings of unequal length attached to a triangular frame. Instruments with a side mouthpiece and a tube containing holes, some of which are closed by keys. Single-reed instruments whose cylindrical tube contains holes (some closed by keys) and ends in a flared bell. Piano whose mechanism is horizontal, allowing the pianist to better control the sound; it varies in size from 2.5 to 2.7 meters. Clarinet with a curved tube; its range is one octave lower than the ordinary clarinet. Valved instruments consisting of a curved cylindrical tube and a flared bell. Series of metal tubes arranged vertically in order of size; small hammers are used to strike the tops of the tubes. Double-reed wind instruments consisting of several tubes; their range is one octave lower than the bassoon. Valved instrument consisting of a curved conical tube and a flared bell. Instrument consisting of wooden bars placed on top of resonators arranged in chromatic order in two rows; the bars are struck with mallets. Instrument composed of a metal bar bent to form a triangle open at one end; the triangle is struck with a metal rod. Instruments consisting of a curved tube with a slide that is lengthened to produce notes varying in pitch by semitones. Instrument composed of two shell-shaped pieces of wood held in one hand and struck together using the fingers. Group of stringed instruments played with a bow. Group of wind instruments made from metal and played with cup-shaped mouthpieces. Group of wind instruments originally made from wood.